November "Mentor of the Month"
This Month's Outstanding Mentor is Georganne Powers! Georganne mentors a 5th grader at Aliso Elementary School. She has been with her mentee since January of last year. 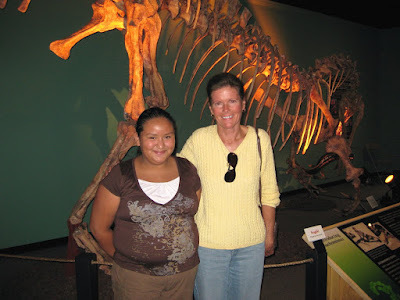 Throughout their time together, Georganne and her mentee have worked on homework together, done arts and crafts projects, and partipated in field trips with other mentors and mentees. Georganne is a great example of quiet service and dedication to her mentee. She will be receiving lunch for two at In-N-Out Burger. Great job, Georganne! Keep up the good work. October "Mentor of the Month"
This Month's Outstanding Mentor is Kate Schwass! Kate mentors a 9th grader at Santa Barbara High School. Kate has been with her mentee for two years. The pair has gone through the challenging and exciting transitions of elementary to middle school, and middle school to high school. Kate has done an excellent job of being a stable and supportive adult that Denisse can count on to be there for her through these changes. Kate will be receiving lunch for two at In-N-Out. Great job, Kate! Keep up the good work!